Editor’s Note: Leading up to the announcement of the 2015 Rider of the Year we are re-releasing pieces of each of the past 14 ROTY articles from the magazine. 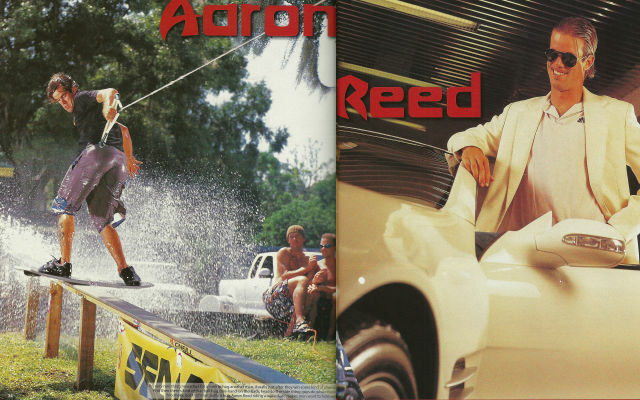 2003 was the year of the incomparable Aaron Reed. Read below to see way and stay tuned for more past ROTY articles as well as the announcement of the 2015 Rider of the Year. Yes, it’s Aaron Reed. And if right now you’re asking yourself, “Who, exactly, is Aaron Reed again?” then yo8u’re probably not alone. The best question is, “What did he have this year on riders like Danny Harf and Parks Bonifay and Shawn Watson?” Hard had one of the better competitive seasons in wakeboarding, pulling back-to-back wins in the Gravity Games and Nationals for a $35,000-plus swing over the course of seven days, and catapulting himself across the invisible line that separates really good pro riders from superstars. And there’s always a strong case for Parks being the “Rider of the…” anything. There’s little doubt anymore that everyone considers him the overall best, and he kicked it up a notch this season innovating new moves off the double up, including a double back roll mobe. Watson was arguable “traditional wakeboarding” better than anyone else in the world at the beginning of 2003 (he was no slouch on sliders either). For the few months after he moved to Orlando in the spring, he was riding so smoothly it was hard to tell he was holding a rope. But in the end it was Reed who stuck out. Like a dirty gym sock hanging on the wall of an art museum – you just could not deny his presence. There are many criteria we consider every year when we undertake our judgemental little task, among them are talent, media exposure, video parts, public sentiment, how much a rider has progressed over a course of 12 months, and how much they have done for the sport. If Aaron doesn’t come in first in all those categories, he’s damn close to the top in every one.